Former President Mahinda Rajapaksa is now caught up in a situation where he has to have the cake and eat the cake. He was scheduled to express his views in Parliament, representing the UPFA, when the UNHRC resolution on Sri Lanka was taken up for debate in the country’s legislature. Many were expecting the “war winning President” to share his views on the pros and cons of the resolution of which Sri Lanka too was a co-sponsor. Surprisingly, former President Rajapaksa, an MP representing the Kurunegala district, ‘dodged’ the debate at the eleventh hour. It was crystal clear that he was not too comfortable about talking in front of his fellow Parliamentarians on the Geneva resolution and Sri Lanka’s efforts towards accountability and reconciliation. Instead of speaking in Parliament, Rajapaksa chose another platform to make the country aware of his views on the Geneva resolution. The place he chose to express his views on the matter was Abhayaramaya in Narahenpita, the de facto political office of the former President after his Presidential election defeat in January. In his public statement about the Geneva resolution, the former President said a number of operative paragraphs in the document posed a threat to the nation. While making the statement, the former President, now a UPFA Parliamentarian representing the Kurunegala district, deviated from his party’s view over the same matter. When asked by reporters as to why he ‘dodged’ the debate on the UNHRC resolution, the former President said he could not attend the debate as he had a “personal engagement”. Rajapaksa's lengthy statement over the UNHRC resolution had following salient points. “The involvement of foreign judges, prosecutors, investigators and lawyers implies the creation of a new criminal justice system parallel to the existing one. I am totally opposed to any such arrangement. I regard that very suggestion to be an insult to our courts system, legal profession, Attorney General’s Department and investigative bodies. Through operative paragraph 8 of the Geneva resolution, the government has already agreed to remove from office members of the armed suspected of having committed human rights violations through an ‘administrative process’ even if there is no evidence against him that can be placed before a court of law. Some ministers claimed in parliament that there is no such recommendation in the Geneva resolution. I state with the utmost responsibility that operative paragraph 4 of the resolution requires exactly that and nothing else. The government has co-sponsored the Geneva resolution without considering its implications and without informing parliament and appraising the people about it. If a separate criminal justice apparatus is to be set up with foreign judges, prosecutors and investigators, our ordinary law as well as the constitution itself will have to be amended. Last week in an interview with The Straits Times in Singapore, the Prime Minister had said that foreign judges will in fact be involved in war crimes trials here. The laws will be changed in this manner for the sole purpose of punishing our war heroes. Changing the constitution itself to punish the war heroes who brought an end to terrorism which had been stalking this land for forty years and which embroiled the country in a raging internal war for 30 years is a dastardly act. People belonging to all communities are now able to live in peace in this country because of the sacrifices made by our war heroes. If we change the law to enable foreign judges, prosecutors and investigators to serve in our legal system, what happens after they finish jailing our war heroes? If the amendments to the law continues to remain even after jailing the war heroes, foreign judges, prosecutors, investigators and especially lawyers will continue to work in Sri Lanka and that may pose a major problem for the legal profession. There are many lawyers in parliament. I too am a lawyer,” Rajapaksa said in the speech he made at Abhayaramaya last week. By making the speech at the Abhayaramaya, the former President attempted to make it look like a statement made in his personal capacity. It was a strong indication that the former President and his party are not on the same page about the Geneva resolution. The SLFP, led by President Maithripala Sirisena, has already welcomed the government’s decision to co-sponsor the resolution and dubbed it as a “major victory” for the country in the international domain. However, Rajapaksa’s move to ‘dodge’ his speech in Parliament at the last moment clearly showed that he did not want to defect from the party at this juncture, although he did not agree with the party’s stand on the resolution. It also sheds light on the complicated situation in which the former President is trapped at the moment. Mahinda Rajapaksa, needless to say, is a shrewd political animal to the core. He knows that the inquiry mechanism into alleged war crimes during the final phase of war in Sri Lanka would leave ample space for an ultra-nationalist political movement in the South to raise its head as an alternate opposition. Rajapaksa is now positioning himself to be the ‘potential leader’ of that possible political movement which will heavily gravitate towards the Sinhala-Buddhist electorate in the South. But, he doesn’t think the Local Government election early next year is a solid platform for a political movement of that nature. At this point, the former President is buying more time, probably until the end-2017, as the MOU between the UNP and the SLFP will come to an end in two years. According to Rajapaksa’s calculation, the end of the national unity government will provide a new opening for him. Soon after the Parliamentary election, Rajapaksa met President Maithripala Sirisena for a closed-door discussion where the former said he would retire from politics in three months. The former President said his sisters wanted him to distance himself from politics. Although nearly three months have elapsed after the meeting, the former President shows no sign of retirement as he feels he will see some light at the end of the tunnel, probably after two years. However, there is one lesson former President Rajapaksa has not learnt after two consecutive defeats at two national level elections, within a period of nine months. Rajapaksa is yet to understand the fact that no party can secure power in Sri Lanka at a national level election without the support of ethnic and religious minorities. This Sinhala-Buddhist only policy cost him the Presidential election and the Parliamentary election this year as minorities rallied around the UNP fearing a Rajapaksa comeback. Therefore, a Sinhala-Buddhist only chauvinistic approach will only confine Rajapaksa to the opposition. As a result of the former President’s hostile approach towards ethnic and religious minorities, the SLFP lost a significant amount of Tamil and Muslim votes at the Presidential and Parliamentary elections. It was one of the key reasons leading to his defeat in January. Interestingly, the former President still thinks pandering to Sinhala-Buddhist chauvinistic sentiments among the voters in the South is his only way-out! In addition to that, the former President has to deal with a few other issues within his own rampart. Although Rajapaksa is ready to wait for another few years to grab an opportunity to come back to power, it is still not clear whether his party associates have the same patience. A sizable proportion of Rajapaksa supporters have already accepted ministerial and deputy ministerial portfolios from the national unity government, extending their support to President Maithripala Sirisena. Some of them opted to remain in the opposition mainly because they did not have courage to take the plunge. Some of them are in the process of repairing their ties with President Sirisena to stay in the good books of the party leader. Against this backdrop, only a handful of party MPs actually support their former leader who is now in a quagmire of some sort. In Sri Lankan politics, loyalty comes in tandem with power. For instance, when President Sirisena defected from the party in November to challenge Rajapaksa's presidency, there were only a few "Maithri loyalists" in the party and some front-line members were even ready to die for the former President. Today, just 11 months down the line, those die-hard Rajapaksa supporters gleefully live under the shadow of President Sirisena. On the other hand, while living his ‘comeback dream’, the former President also has to deal with a number of issues on the anti-corruption front. Apart from the ongoing investigations in Sri Lanka, a number of foreign nations have extended their support to the Sri Lankan government to ‘unearth’ stolen assets belonging to top echelons of the previous regime. The government has also sought assistance from the World Bank’s Stolen Assets Recovery programme and the Serious Crimes Office of the UK. At the same time, the PRECIFAC, appointed by President Maithripala Sirisena, is also investigating into several cases involving the former President and some of his close associates. 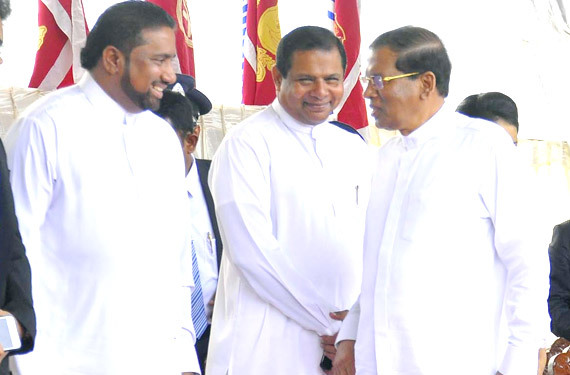 Will Maithri rely on the ‘East’? Meanwhile, President Maithripala Sirisena made an important step in the direction of accountability and reconciliation by convening an all-party meeting on October 22 to discuss about the domestic inquiry mechanism. All major political parties of the country were invited for the all-party meeting, irrespective of their presence in Parliament. One significant outcome of the APM was that none of the parties said Sri Lanka should avoid a war crimes investigation. Even the parties that have an ultra-nationalist outlook said the Sri Lankan government should carry out an investigation to ascertain the veracity of war crimes charges. The division was actually over the involvement of foreign judges and prosecutors in the war crimes inquiry. Some parties of the UPFA said they vehemently opposed any move to include foreign judges and prosecutors in the inquiry mechanism. On the contrary, the resolution passed at the last session of the UNHRC specifically refers to the inclusion of foreign ‘judges’ and ‘prosecutors’ while highlighting the parameters of Sri Lanka’s war crimes inquiry mechanism. Therefore, striking a balance with the aspirations of the UNHRC and those of the political parties in the south will be a major challenge for the Sri Lankan government within the next 18 months. The President however informed all political parties to present their written submissions on the matter within a period of two weeks. The President is to examine their submissions following his visit to Thailand during the first week of November. A week after his return from Thailand, the President is to convene another all party meeting to discuss further on the matter, based on their written submissions. “There is no way that the government can avoid international participation in the war crimes investigation. But, the government still has an opportunity to avoid foreign judges and prosecutors and proceed with international observers. For that, a credible domestic inquiry mechanism has to be set up and the government must convince the international community of the independence of the inquiry mechanism. That’s one model the government can adopt,” a senior spokesman of the government told the Daily News, explaining the government’s line of thinking on the matter. However, the Sri Lankan government has a strong support-base among Japan and South East Asian countries. Prime Minister Ranil Wickremesinghe’s recent visit to Japan laid a strong foundation for an initiative of that nature. On the other hand, the Japanese involvement in the accountability process may not trigger extremist sentiments in the South as Japan has been a long-standing friend of Sri Lanka in the international domain. A key part of the inquiry mechanism will be the setting up of the special high court, as suggested by the Maxwell Paranagama Commission report. Highly placed political sources said a special High Court to try war crimes and International Humanitarian Law violations would be formed through a special act in Parliament. In an interesting turn of events, former LTTE military wing leader and former Minister Vinayagamoorthi Muralitharan alias Karuna Amman had said he would resign from the SLFP and join the Tamil United Liberation Front (TULF) led by V. Anandasangaree. The former MP, who was also the founding leader of the TMVP, was made a Vice Chairman of the SLFP when former President Rajapaksa was the party leader. Karuna lost his positions in the party when President Maithripala Sirisena became the party leader and he failed to secure a seat in Parliament after the General Election in 2015. Karuna is to address a media conference on November 14 to announce the reasons for his decision. While ruling out any disputes with the SLFP, Karuna said his decision was purely personal. Karuna said he saw a better political future for him with the TULF and Anandasangaree, a vociferous critique of the atrocities committed by the LTTE and a staunch backer of a political solution for the people in the North and the East. Karuna said his decision was not a sudden one and added that he had several rounds of talks with Anandasangaree before arriving at the decision. Anandasangaree, an octogenarian who is not very active in the political domain, is probably of the view that his party will have some future in the hands of a relatively young politician such as Karuna. On the other hand, Karuna too can position himself as a future leader for the TULF under the shadow of Anandasangaree, a very seasoned politician who has lived through a tumultuous era for Tamil politics and politicians. He has also added that several grassroots level politicians from the Eastern province too would join him and contest future elections from the TULF. Commenting on reasons leading to his resignation from the party, the ex-Parliamentarian said the SLFP was moving “slow” on the Tamil question. Speaking to reporters over the phone on Monday, he said the North and Eastern provinces should be merged and the 13th Amendment should be fully implemented. Even before he entered active politics in 2008, Karuna said he supported the full implementation of the 13th Amendment. Therefore, it has been his position over the past seven years when he was a front-line member of the SLFP, under former President Rajapaksa. “We know the Provincial Council system will not bring a solution to the Tamil problem, but we cannot miss this opportunity. If we miss this opportunity the power will go to other parties. Our party will also attend the next sittings of the All Party Representative Committee (APRC) and demand the full implementation of the 13th Amendment. Our aim is to allow the people in area to benefit from the resources in the province,” the ex-Parliamentarian said in July, 2008, soon after he was deported from Britain for violating immigration and emigration laws. However, the real issue behind Karuna’s defection from the SLFP was something else. His ‘love’ for the full implementation of the 13th Amendment and the re-merger of the North and East provinces did not nag his mind when he was affiliated with the former President. In fact, the Rajapaksa administration was not even willing to discuss the full implementation of the 13th Amendment saying giving police powers to provinces posed a great threat to national security. At no point did Karuna Amman raise any objection on the rigid stance of the previous government when it came to the full implementation of the 13th Amendment. Karuna’s decision comes in the wake of several investigations initiated by the CID into certain incidents swept under the carpet by the previous government. Among them are investigations into the murders of ex-Parliamentarians Joseph Pararajasingham and Nadaraja Raviraj. Karuna’s former associate Sivanesathurai Chandrakanthan alias Pilleyan is already behind the bars in connection with Pararajasingham’s murder. Pararajasingham was murdered on December 25, 2005, when Karuna and Pilleyan were together as the leader and the deputy leader of the Karuna wing, a para-military group operated under the blessings of some topnotch members of the previous administration. On the other hand, the large majority of former intelligence wing members who are being detained by the CID over the disappearance of journalist Prageeth Eknaligoda are former members of the Karuna wing. Some members defected from the LTTE along with Karuna and Pilleyan in 2004. Many believe that law enforcement authorities will question Karuna Amman too over certain atrocities committed during the final phase of war. When Daily News asked him about the matter on Monday, Karuna said that he had not wielded weapons after entering politics. The former LTTE Eastern commander said he had not operated any paramilitary groups under the names of the Karuna faction or the Karuna group after entering politics. Karuna said he had been totally against the forcible recruitment of children and elder people to wield weapons for the LTTE and added this was one of the reasons for his exit from the outfit.